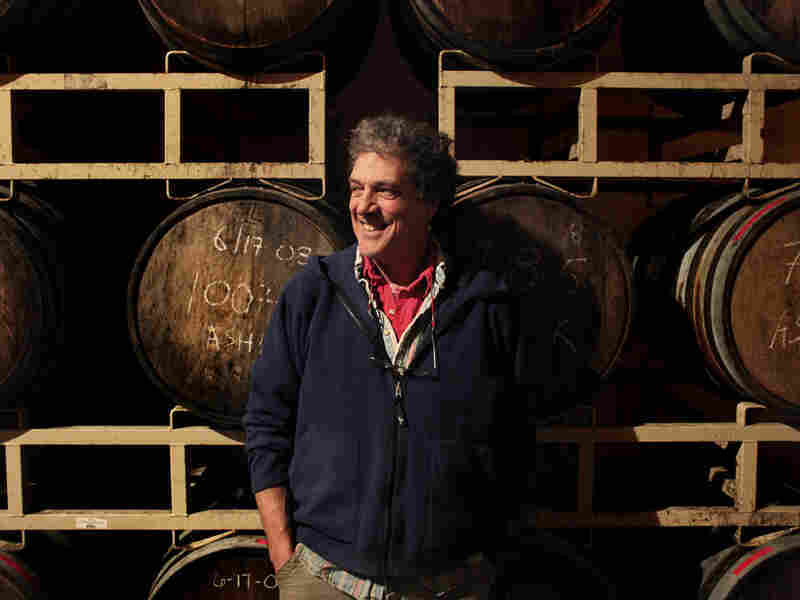 In New England, Hard Cider Stages A Comeback Apple growers in New England are looking to hard cider as a way to beat dropping prices and foreign competition. The fermented cider was the drink of choice for the nation's founding fathers. One New Hampshire orchard is out to turn the region into the Napa Valley of hard cider. 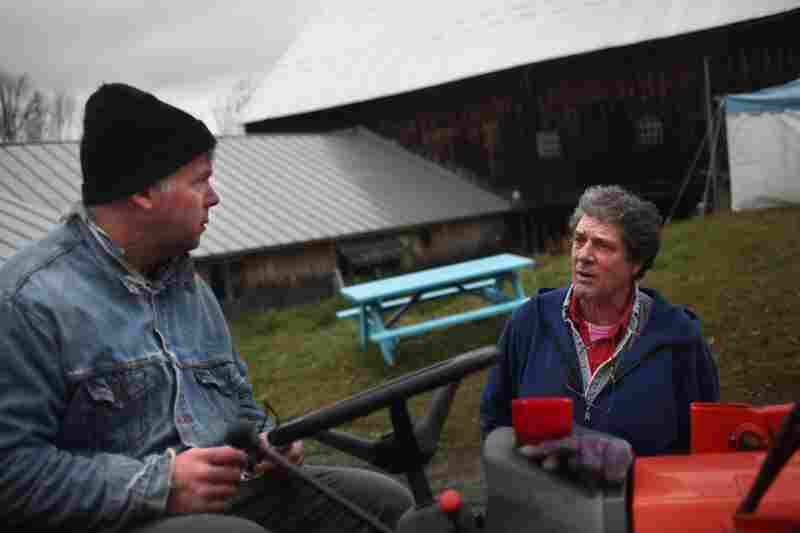 Steve Wood has been making hard cider for more than 20 years at Poverty Lane Orchards. He works on land purchased from his father almost 25 years ago, and his business, Farnum Hill Ciders, is seeing a recent growth in demand and production. Wood (right) gives Jeff Williams last-minute instructions before Williams goes to work in one of the orchards. Wood thought it was going to be an easy day, but it quickly turned busy. "You can never tell what your day's going to be like — keeps all of us on our toes," he said. 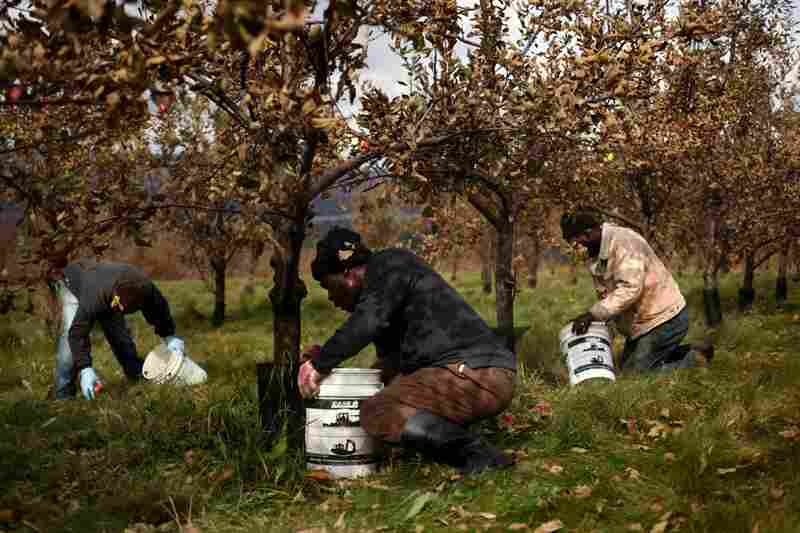 Wood recently hired more people to work in his orchards. Elburn Brown (from left), Kenneth Woodhouse and Jeff Williams pick and load cider apples. William Crawford poses for a portrait while picking apples. Almost all of the pickers at Poverty Lane come from Jamaica for seasonal work, and return after the harvest season is over. The apple pickers work steadily throughout the day, stopping only for a lunch break. James Gerlack sorts through a crate of apples to be sold at Wood's Poverty Lane Farm Stand. Jess Saturley (left), Dwayne Webster and Gerlack stack and move crates of apples in the packing room at Poverty Lane Orchards. Saturley adds sucrose to one of the cider containers. One of the company's newer employees, she has been with Farnum Hill for nearly a year. 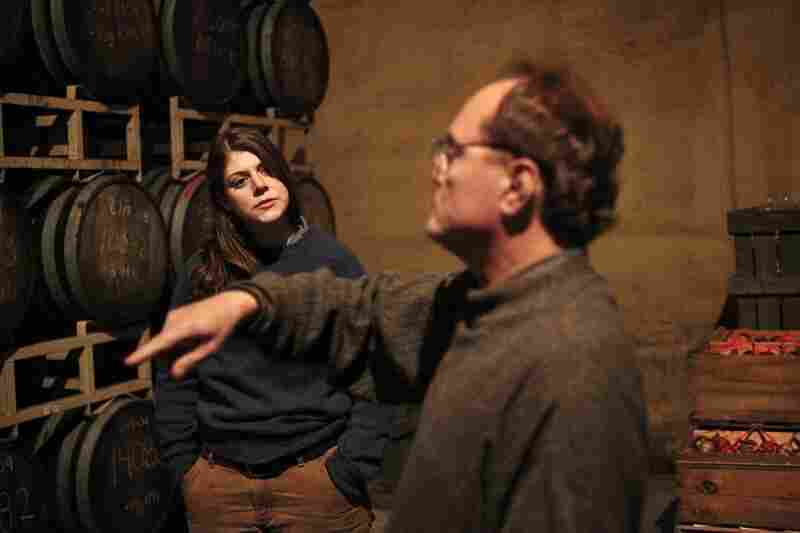 Ted Fondulas asks Saturley questions about the cider-making process, which takes about 14 months. 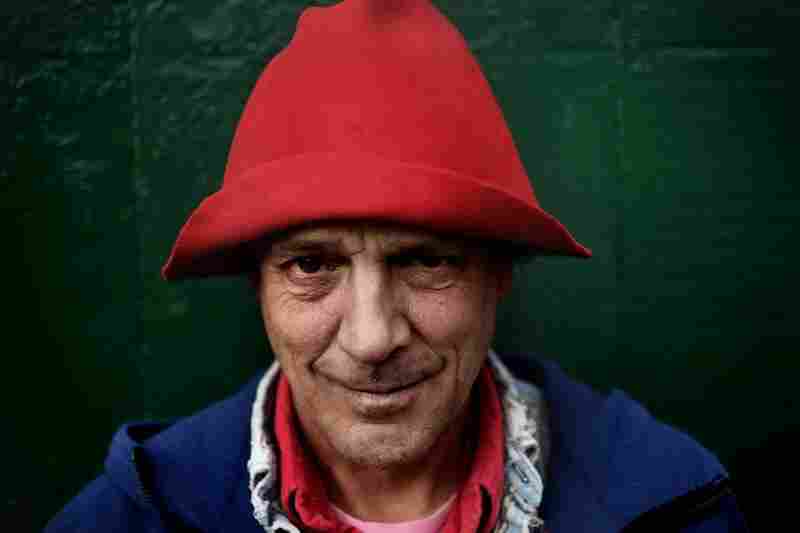 Fondulas and his wife, Linda, who own a restaurant in Killington, Vt., were interested in carrying the cider. 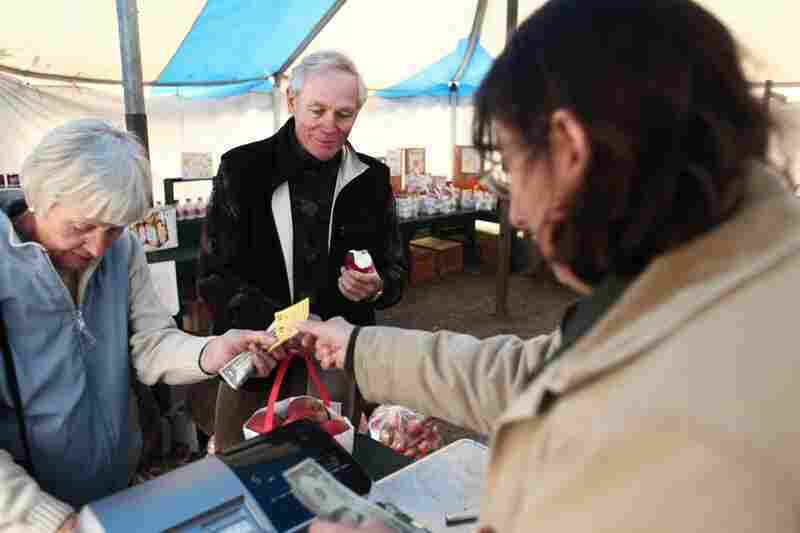 Brenda Bailey Collins (right) helps Jan and Ed Jenik purchase apples and cider at the farm stand at Poverty Lane. The stand is open from Labor Day weekend through Halloween. Samantha Dodge (left) and Brandon Rich play with Wood's dog Newton while picking their own apples at Poverty Lane. The dog spends a great deal of time socializing with people in the orchard. Though Wood is the owner and manager of Poverty Lane Orchards and Farnum Hill Cider, he is also involved with the labor at the farm. In New England, the tradition of making and drinking artisan cider goes back to the Founding Fathers. Now, a New Hampshire apple grower is hoping to revive the American cider tradition and provide a lifeline to struggling farmers. 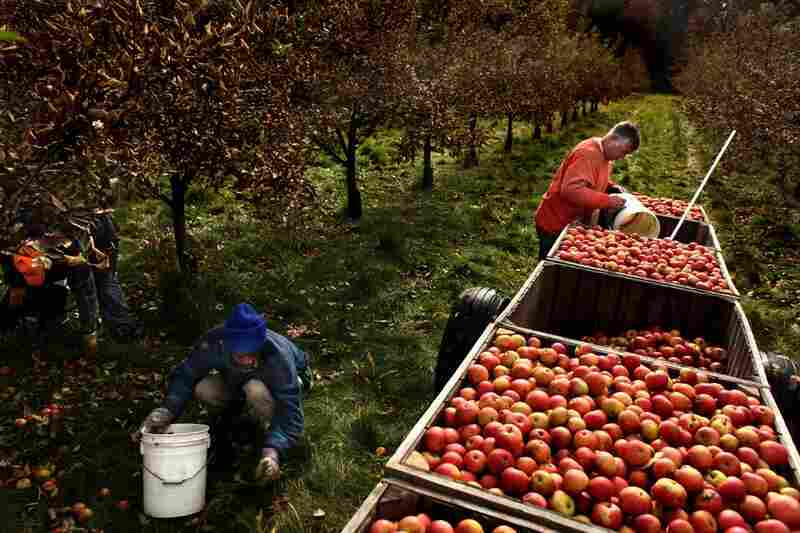 On a late fall day, the production floor at Poverty Lane Orchards in Lebanon, N.H., bustles. 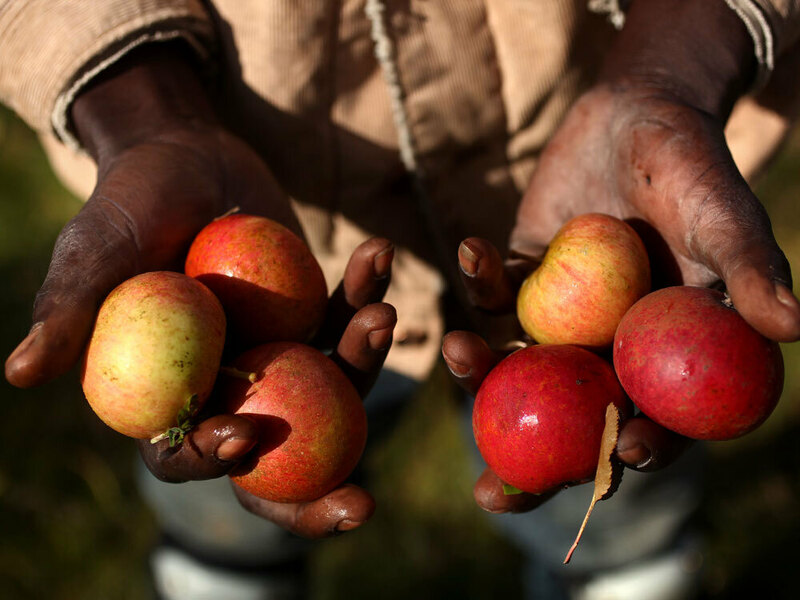 A half-dozen seasonal employees from Jamaica grind the apples, press the juice and add yeast. Owner Steve Wood began converting his orchards to cider apples 20 years ago. Red Delicious apples from Washington state and cheap imports from China were flooding the market. Steve Wood is the owner and manager of Poverty Lane Orchards and Farnum Hill Cider. "You know, we were growing the same fruit and getting the same praise we had done before, but we weren't getting as much money, and it was clear we couldn't keep doing it," said Wood. 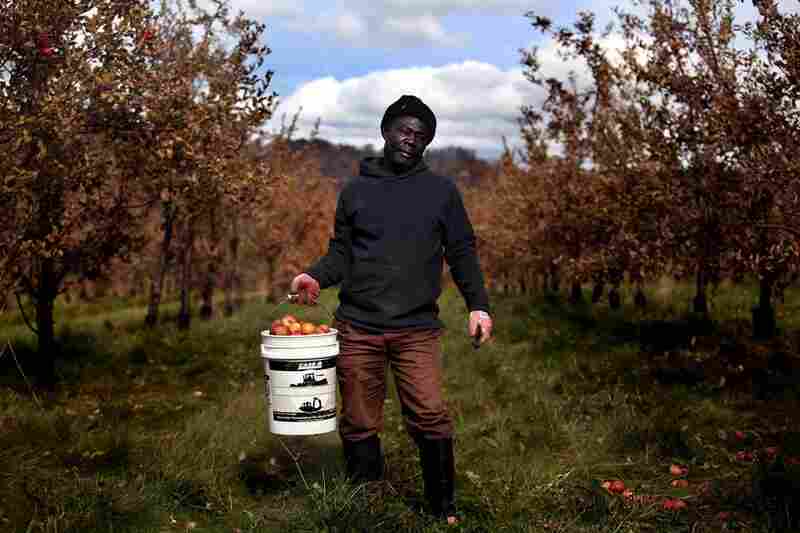 Many apple growers switched to other crops. 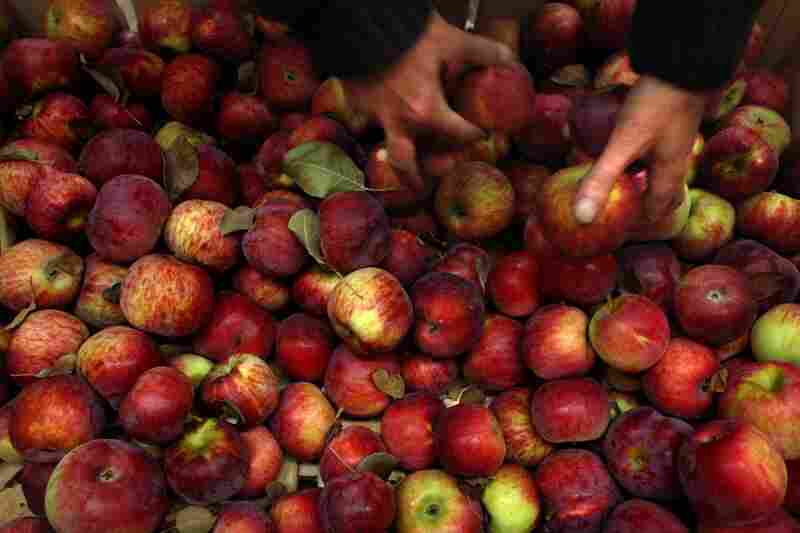 In two decades, the acreage of apple trees in New Hampshire dropped by nearly half, to 2,100. So Wood hatched a plan: recruit other apple growers to resurrect New England's long-dormant hard cider tradition. "Growers come here and I give them grafting wood," said Wood. "I give them whatever they want to help them get started. We don't play our cards very close to the breast. I'll tell anybody exactly what we do and how we do it." Chuck Souther and his wife operate Apple Hill Farm in Concord, N.H. Souther decided about six years ago to take Wood's advice and convert two acres of his land to growing cider apples, "which was a little bit of a leap of faith," Souther said. "Almost all the other apples we grow, we can do various things with them. [But] these apples are inedible. They are high in tannin, high in acids — there's a strong retch factor. When you eat one I liken it to biting into a fresh cranberry." 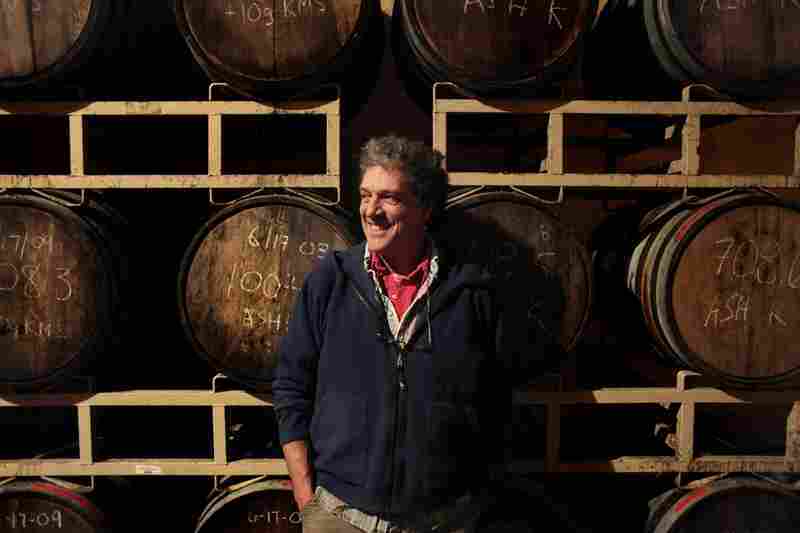 Souther hopes to be federally licensed to sell fine cider by the end of the winter. But Wood says other growers won't be able to make that leap. "They can't do it because they are so financially strapped that they can't raise the capital to replant once again," said Wood. Fitz Campbell holds the apples that they use at Farnum Hill specifically for the cider that's made there. Campbell says these apples are the best ones for the cider. Wood's label is called Farnum Hill Ciders. It's received favorable reviews in The New York Times and Wine Enthusiast. 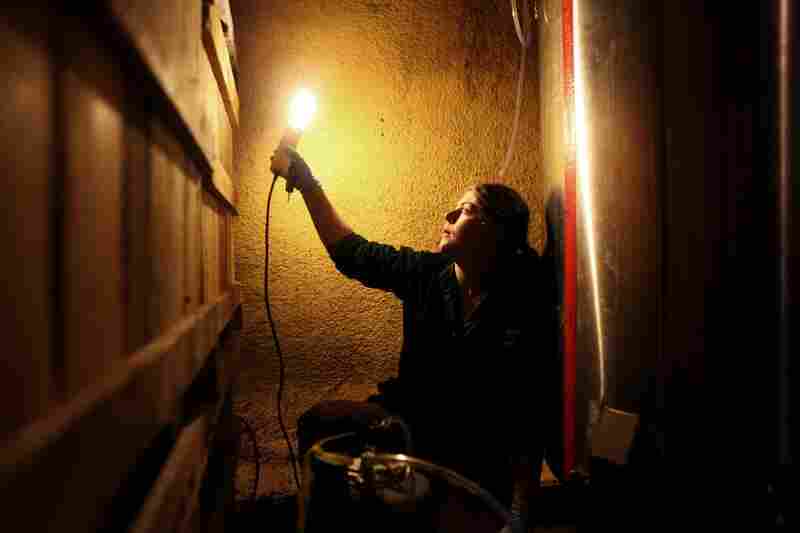 But distributors are skeptical about the demand for fine cider. Some retailers are placing his bottles on the bottom shelves, alongside cheap wines. "It's a long job," said Wood. "It's a long job to develop a market where there is none." "Dry, sparkling, and a little different," said Goodman. "Very drinkable." Despite the long odds, Wood envisions New England becoming the Napa Valley of fine cider production. It wouldn't be unprecedented. It was the drink of choice of American colonists, and John Adams was said to consume a tankard a day. In that sense, Wood is like a modern-day Johnny Appleseed. Who, by the way, also planted cider apple trees.